A couple of weekends ago I got down to installing the crash bars, headlight guard and skid plate, which I had not had time to install when I did the panniers and GPS mount. I had seen some people have trouble aligning the mounting points with the chassis on YouTube tutorials, but I am happy to say I had absolutely no problem. The only setback came from the long screw that goes from one side of the chassis to the other and supports the engine block. The crash bars that were installed on the bike when I bought it second hand were the original Suzuki ones, and they are attached to that screw. I imagine that when you buy them the mounting kit includes a longer screw that enables you to attach them. I removed the crash bars and saw that with separator washers the screw had enough thread in it to stay in place effectively, so I thought I would have no problems installing the Hepco & Becker bars, which attach to different mounting points. However, they partially cover the recess on the chassis where this screw is located, and because the longer screw I had in my bike protruded out of the chassis, it was impossible to fit them. So, a week later and having purchased the original screw from a Suzuki dealer I was able to fit the bars without any problems. They offer far greater protection than the original ones, are thicker and look cooler. The problem came, however, when I had to install the skid plate. Adventure MotoStuff had supplied it with a mounting kit for the Hepco & Becker crash bars, but from what I could gather from the pictures, Hepco & Becker had discontinued the bars for the pre-2012 V-Strom and developed new ones for the new model. Since both bikes have the same chassis the bars will also fit the older ones, and these are the bars that I had bought. However, AdventureMotoStuff had sent me the kit for the older model, which has a lower crossbar, so the mounting brackets were about 100 mm too low. 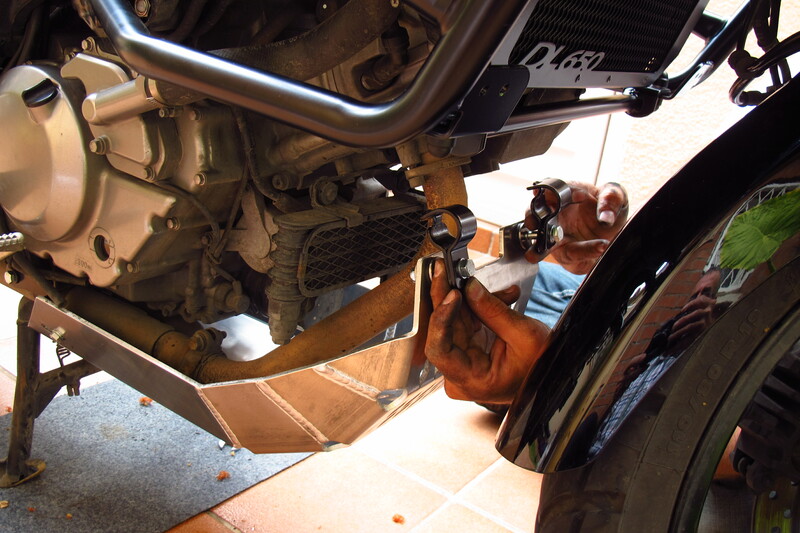 Now, on a previous post I made positive comments about this company’s customer service, when I was trying to decided which combination of crash bars and skid plate to use I wrote to them and they replied promptly with clear and useful information. I am afraid that I will have to withdraw those comments now… I sent them an email explaining the problem I had and including some pictures for reference, inquiring whether they manufactured mounting brackets for the new bars or not. That was two weeks ago. I am still awaiting their reply. It is a lot more solid than it looks or than I expected it to be, so I am quite optimistic that it will work without problems during the trip. 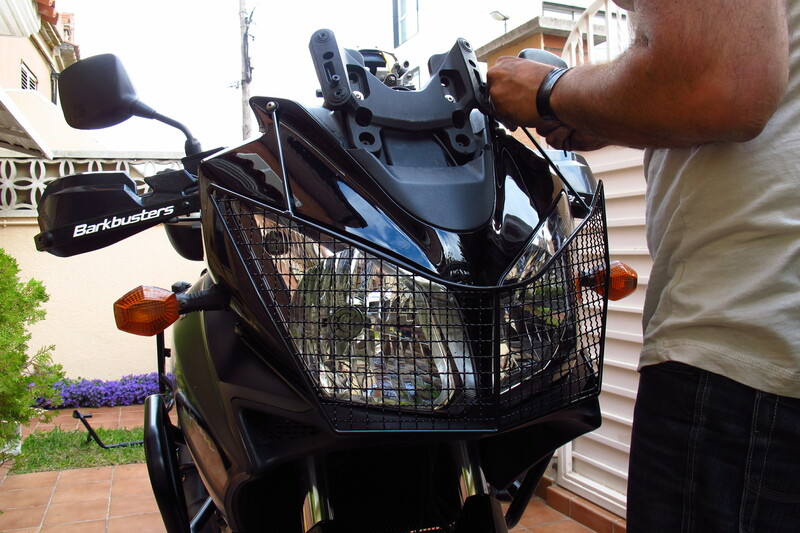 Finally, I fit the headlight guard. The V-Strom has enormous headlights and they are very exposed to small stones flying from the road or even small falls, so I decided this was a must. However, with such big headlights the mesh I had to fit was enormous, unlike the more discreet protectors for, say, a GS. Even so, once fitted it looks better than I expected. 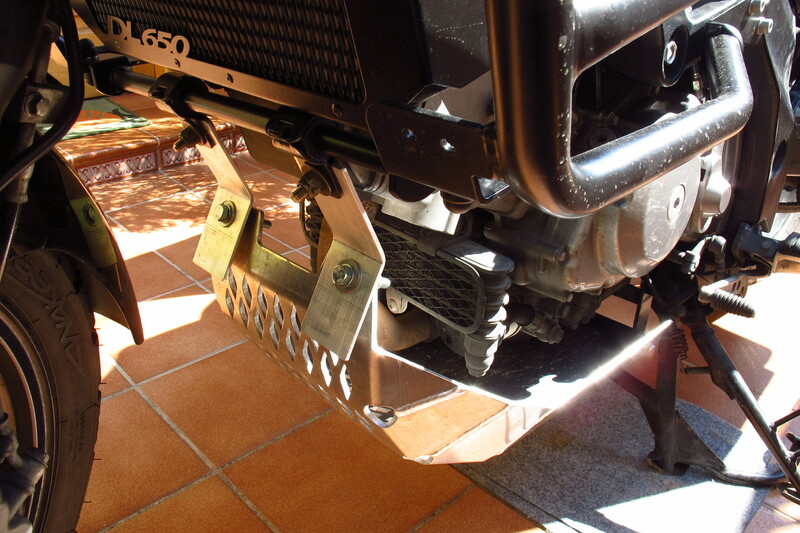 This entry was posted in Preparation, Stroming The World 2013 and tagged Adventure MotoStuff, crash bars, engine guard, headlight guard, Hepco & Becker by Kilian. Bookmark the permalink.